Tom: By any chance did you see that email I sent you at the horrendous hour of 1:30am? TP: Don’t worry, most of us do. LD: Yeah but then you even wonder what it is you do and why… You know how sometimes people have a really specific thing they say about their work? You know, commenting on this or that, or I want to make the world a better place because I make this stuff. TP: Yeah but I think it’s quite normal. How about we start with your process then. I really want to know how you think your process begins. LD: I was thinking about it in relation to the Genie Bottle works [currently on show at the National Art School Gallery, Sydney]. Being invited to exhibit in TURN, TURN, TURN made me really think about working with clay over the past thirty years. LD: Well, my work really has evolved and changed due to life circumstances and experiences. At one stage when I was undertaking my Masters, it went through a period where it became quite controlled and uptight and laboured. Thinking about that recently, I realised it was about a loss and change and a reflection of how Australia has changed during my lifetime. Lately as things have evolved, I’ve been looking back to some really early processes, to reintroduce colour and a sense of play and really push the tactile qualities of the clay. TP: So when you talk about control, you’re speaking about the bodies of work using white porcelain [produced between 2007-2012]? LD: Yes, the white porcelain works, with the found objects. TP: I suppose you could attribute ideas of ‘control’ to the simplicity of the line and lack of colour in the work? Plus they’re meticulously made! LD: Yeah, when I was making that work I was thinking about the power of them as simple objects and the way they embody all these memories and anxiety and a sense of loss and nostalgia. And even though those works look quite different to everything since, the ideas have carried through. I’ll always be interested in the relationship between the material and the spiritual world. TP: What is it about turning an idea or a memory into an object that interests you? LD: Well, to me, making these works is sort of just reinforcing the importance and power of inanimate objects around you, but questioning that too, questioning their value. But you know, I think as you go through your life you go through weird, changing relationships with objects and the way they track your life. They’re like markers of time and of the people around us. We’re always looking at them and we continue to absorb their qualities. TP: Do you mind if we go back to what you said about the works reflecting what’s around you? LD: I suppose the series of Genie Bottles are probably a good example of that, as I made those as a reaction to a friend who had concerns about their future and I wanted to find a way through with the work, even in a light-hearted way. TP: And there’s so much symbolism of stored energy that can be associated with an object like this. So are the recent figurative works always referencing people you know? Like, if the work is called Jen, is it always based on a Jen around you? LD: [Laughs] Kind of, because subconsciously it’ll be about who I’m thinking about at the time. But not always. I mean some of them are named after people I’ve known in the past, people who are no longer around. TP: Finally, what do you think is next for your work? LD: At the moment there’s quite a bit in the studio, so I want to explore some relationships between multiple works in bigger settings. For a long time I would go about making things as stand alone objects but now I’m thinking about how certain elements can be placed together in different ways, so we’ll see. 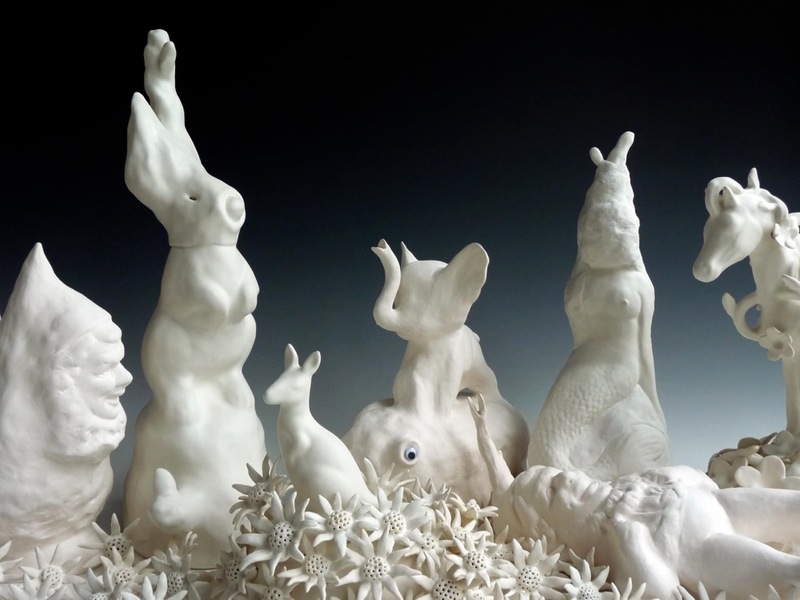 TURN TURN TURN: The Studio Ceramics Tradition at the National Art School, National Art School Gallery, Sydney, 5 June – 8 August 2015. 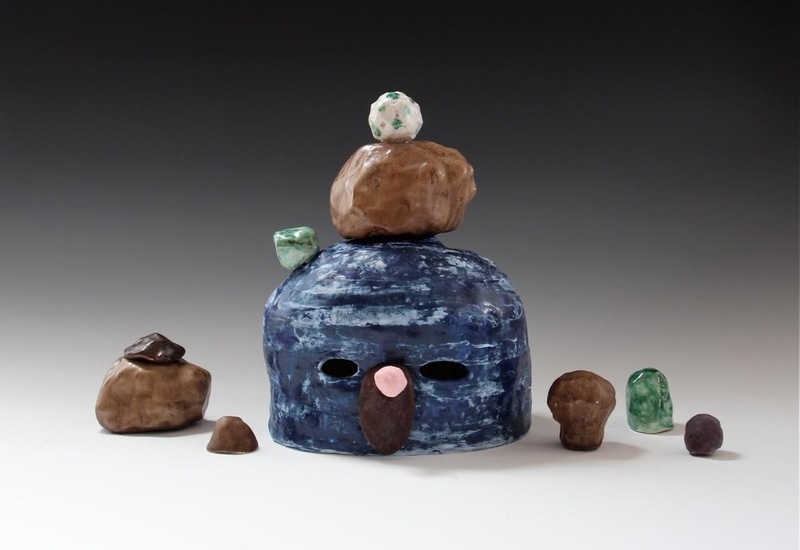 Lynda Draper, ‘Self Portrait with Hair Down’, 2015, earthenware, various glazes, 39 x 25 x 35 cm. Image courtesy of the artist and Gallerysmith, Melbourne. 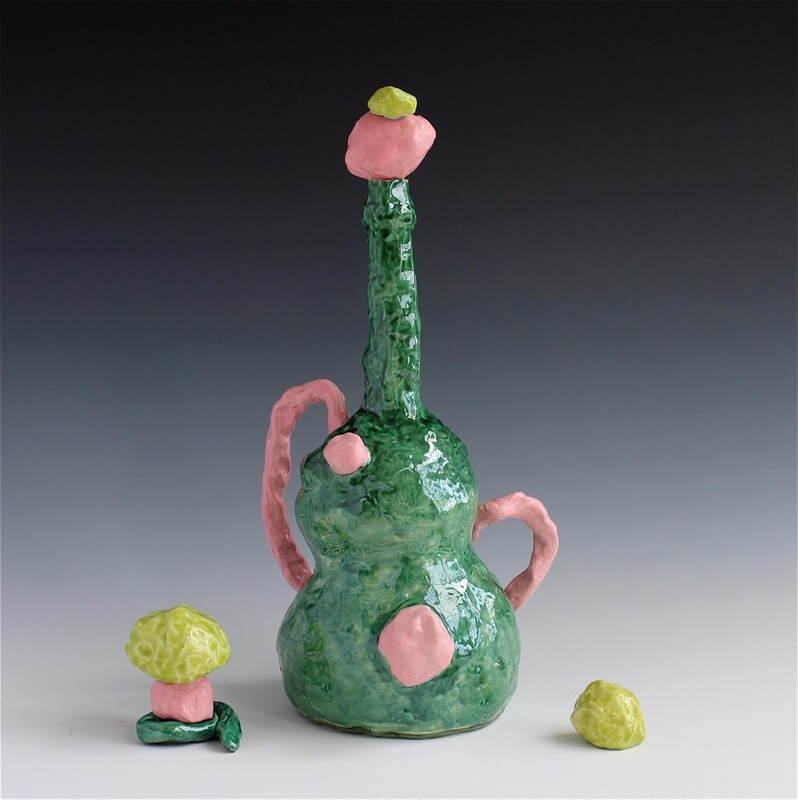 Lynda Draper, ‘Emerald Genie Bottle’, 2014, earthenware, various glazes, 46 x 35 x 27 cm. Image courtesy of the artist and Gallerysmith, Melbourne. Lynda Draper, ‘Home Altar’ (detail), 2010, hand built porcelain, multiple glaze firings, 50 x 150 x 60 cm. Image courtesy of the artist and Gallerysmith, Melbourne. 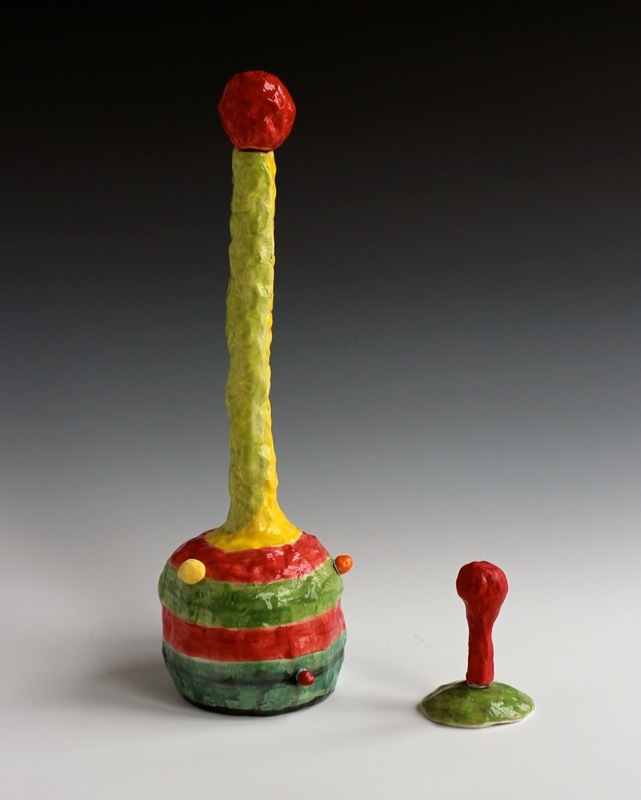 Lynda Draper, ‘Genie Bottle’, 2014, earthenware, various glazes, 50 x 35 x 35 cm. Image courtesy of the artist and Gallerysmith, Melbourne. 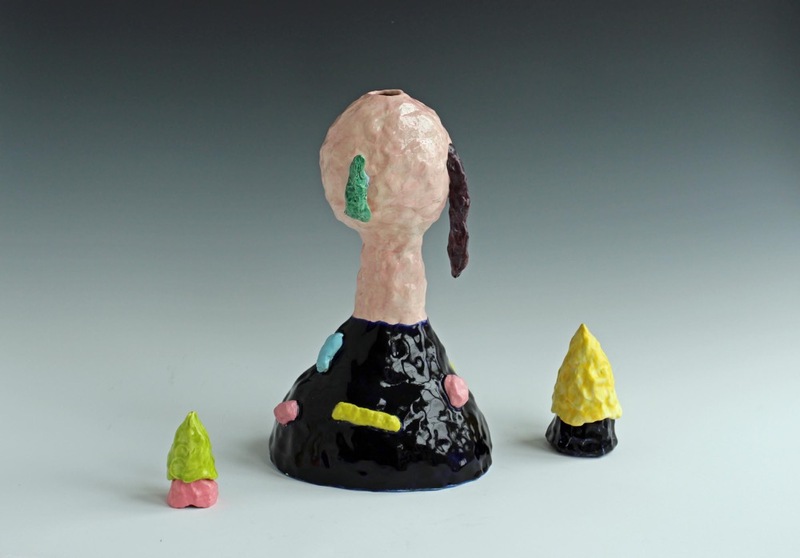 Lynda Draper, ‘Mel’, 2014, ceramic, various glazes, 30 x 50 x 20 cm. Image courtesy of the artist and Gallerysmith, Melbourne.